it’s been quite a long time since i’ve posted something about new software additions to my mac. this app here is actually completely useless, but nonetheless it’s been running since half an hour. 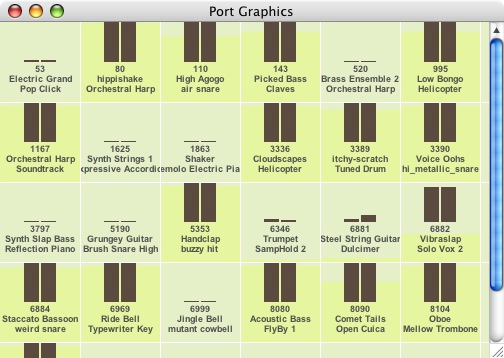 sound of traffic is a tiny java application (112 kb) that converts your network traffic into midi notes. my traffic sounds like a laid back chill-out track (i’m downloading/seeding the latest episode of the it crowd over bittorrent and updating some feeds from time to time). the app needs your admin password to access some devices and only works on OS X and Unix . ändu, couldn’t you use this for your next song? das glaub ich nicht, oder hab’ ich wirklich so viele leserInnen? Keine Ahnung, musst hald mal einen Blick in dein Log werfen. Vieleicht hat noch wer anderes einen Link gesetzt, aber die Downloadzahlen sind von etwa 20 im letzten Monat auf über 100 geklettert! Irgendwie tönt das bei jan tatsächlich schon nach was.